Government initiative aims to help small and medium enterprises and spark economic growth in Russia. A new government stimulus package includes a two-year tax holiday for small and medium enterprises (SME) in manufacturing, services and research. The new legislation will also include more favorable conditions for businesses operating in the Russian Far East and Eastern Siberia, where new companies opening will enjoy a five-year tax holiday. Russia has for the first time made it to the Bloomberg Top 50 of the best countries for doing business. The agency has rated Russia 43rd out of 157, up from 56th last year. Bloomberg experts say the Russian economy's strengths include a big consumer market and WTO membership. The country’s overall score was brought down by the "less tangible costs” category, which includes various aspects of government regulation. 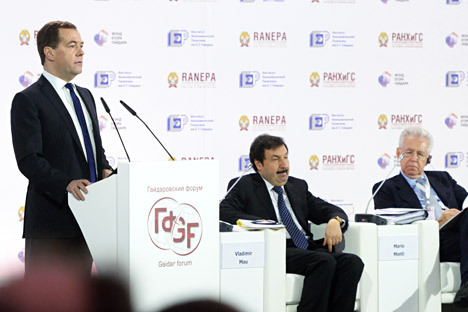 Russian Prime Minister Dmitry Medvedev announced the package at the Gaidar Economic Forum, which was held from January 15 to 17 by The Russian Presidential Academy of National Economy and Public Administration (RANEPA) in Moscow. RBTH sources said the Finance Ministry is now working on a bill that will put the initiative into effect before the year's end. Anatoliy Voronin, an analyst with FIBO Group, said the stimulus measures aim to boost the creation of new jobs in manufacturing, services and research, key areas of growth for the Russian government. Another major innovation to be implemented in 2014 is the establishment of the Federal Guarantee Fund, which is designed to make it easier for businesses to gain access to credit financing. The fund will build upon the existing regional programs of government-backed loan guarantees. Natalya Larionova, the head of the SME and competition department at the Economic Development Ministry, told RBTH that the fund will support new investment projects worth a minimum of 300 million rubles (about $9 million). Russia now operates a system of 80 regional loan-guarantee funds, which issue guarantees for loans of up to 100 million rubles ($2.95 million) . The Federal Guarantee Fund will back the regional funds, effectively acting as a reinsurer. "The federal fund will enable the regional ones to issue more guarantees,” Larionova explained, emphasizing that the commercial bank that issues the loan will still act as the main financial backer of the investment project in question. The guarantee fund will step in only if the commercial bank is ready to issue the loan, but the borrower does not have sufficient collateral. As part of another stimulus measure under new federal rules that entered into force on January 1, 2014, at least 15 percent of government contracts must now be awarded to small businesses and socially oriented, not-for-profit organizations. The government has also tried to make it easier for small and medium businesses to secure a market for their products and services by inviting only small companies to bid for some of the government contracts. Within the next 12 months, the new procedure will also begin to apply to contracts announced by government-owned corporations and natural monopolies with an annual turnover of over 1 billion rubles. The proportion of contracts they are required to award to SME may grow from 10 percent in 2014 to 25 percent in 2018. Another new stimulus measure to be offered to companies investing in innovation is Tax Increment Financing (TIF). This is a way of using future gains in taxes to subsidize current projects. It provides an incentive for investors without requiring the government to spend any of its own money when the project kicks off. Foreign investors will also qualify for all the stimulus measures announced by the government, but only if they meet several conditions. Under Russian law, small companies set up by foreign citizens acting as individual entrepreneurs enjoy the same rights as Russian small and medium businesses. If, however, the company was founded by a foreign legal entity (e.g. a foreign firm), it will have to seek a large Russian partner or several smaller partners if it wants to be treated in the same way as any other Russian company. The stake controlled by the foreign firm in such a venture cannot be larger than 25 percent. Finally, the government will spend more than $628 million (21 billion rubles) in subsidies as part of its SME support programs this year.